An in depth look at the steam scene on the Wirral peninsular from Chester to Birkenhead, Bidston to Shotton. Fifteen cameramen supplied material for this video, notably John Ryan, a local enthusiast from Bromborough. From Chester we take the LMS and GWR Joint line to Hooton calling at Upton, Mollington and Capenhurst. Here the line was joined from the east at Mouldsworth via Ellesmere Port where a visit is made to the Manchester Ship Canal Railway. Returning to Hooton, we go north to Birkenhead calling at all stations. Birkenhead provides nostalgic views of Woodside station, the ferries to Liverpool and a glorious sight of the liner “Empress of Canada” docking there. A prolonged visit to Birkenhead Shed precludes a visit to the Docks lines with mogul 42942 and early 1970′s tours with industrial steam engines. Coverage is then given to the Bidston to Shotton ore trains seen everywhere along the route from the Docks to Shotwick Sidings with 9F power right into the steelworks. At Bidston we divert to New Brighton worked by ex-GWR pannier 4683. Motive power to be seen include 2-6-4 tanks, Black 5′s’, 9F’s, Standard 4′s, Crabs and visits by B1, A2 and a Castle on the last day of steam services from Paddington to Birkenhead. 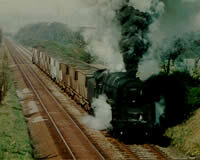 A film full of atmosphere and nostalgia for anyone who knew the railways of the Wirral or not. 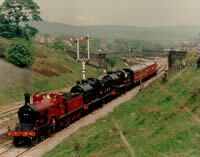 A film on the railways between Bristol, where the River Severn eventually reaches the sea, and Wrexham, close by the River Dee, in the age of steam.The Midland route is taken from Bristol to Gloucester calling at Berkeley Road for a l4xx on the Sharpness branch. 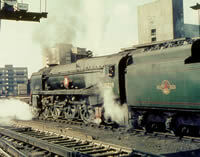 Gloucester on the Severn shows normal steam freight working before 3440 “City of Truro” visits in 1985. We go north via Ashchurch with 1420 and 6435 to Worcester. 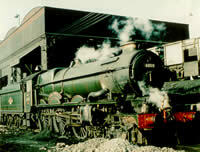 Here we visit the shed and even the works in 1965. A diversion away from the Severn takes the story through Birmingham and Wolverhampton, the Great Western’s route to the north. A Duchess pacific roars through Winson Green. 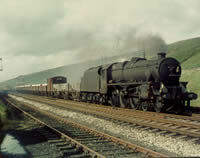 On via Madeley Junction and Upton Magna, which closed in 1964, showing more steam. Shrewsbury, standing well and truly on the Severn, is covered in detail and interesting rare views portray a Royal train, a diesel crashed into a signal box, a Duchess on a running-in turn from Crewe in 1962, amid normal steam working up to March 1967. We then go north to Gobowen and Oswestry. 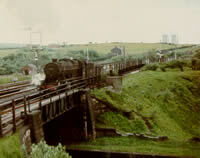 The days when Weston Rhyn had loops, signal box and exchange yards for Ifton Colliery are seen, days of industrial locos working the line to the colliery. 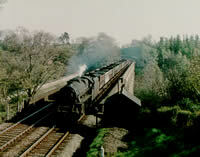 1966 steam takes us over the Welsh border at Chirk onto the River Dee viaduct at Newbridge. County Class 1011 visits Ruabon. and Black 5′s lead on to Wrexham. 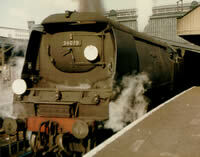 A few scenes of steam railtours in the 1970′s are included to enhance the story but they were still seen amid the infrastructure of a steam worked railway of semaphore signalling and crossing gates. To delight all LNER fans this video portrays the end of North Eastern steam in Northumberland and Durham. More than that, it includes a journey along the East Coast main line from Kings Cross when Al’s, A3’s and A4 ‘s ruled south of Peterborough. Lineside action from Wood Green, Brookmans Park and Hatfield in 1962. 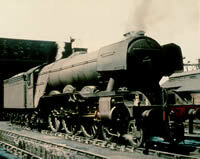 Visit Retford for 02 and WD, travel north to York via Doncaster. A shed visit at York and a works visit at Darlington. Newcastle had a visit from 60019 and 7029 “Clun Castle”, a K1 emulating the Western product with its own copper cap! Bedlington and Blyth on north Tyneside in detail for J27, Ivatt and K1 moguls and Q6. Tyne Dock where engines came home for a rest. 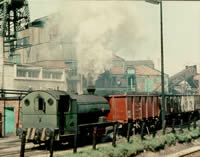 Hartlepool shed provided engines for the Durham coalfield, Hall Dene has lineside action. Ryehope Grange was never quiet and traffic for Silksworth and Seaton very spectacular. Amongst all this, visits are made to Ashington, Philadelphia and Seaham Harbour. A footplate ride on a J27, visits to signal boxes all included in this tribute to North Eastern steam as you have never seen it before.